Perhaps the most surprising thing about the Newt surge is that the man’s past has yet to catch up with him. At first glance, Newt Gingrich seems like God’s gift to opposition researchers. There’s the $1.6 million fee he collected from Freddie Mac, the $500,000 line of credit he holds at Tiffany’s, and the climate-change ad he filmed with Nancy Pelosi. Like Herman Cain, he has a history of sexual improprieties. Like Mitt Romney, he has a less-than-perfect pro-life record. Most damningly in today’s Republican climate, he is the ultimate Beltway insider—and has been for nearly two decades. All of which begs the question: Why won’t the charges stick? I suspect the problem is that there’s just too much: too much scandal, too much hypocrisy, too many hints of corruption. At some point, it all just becomes indistinguishable noise. 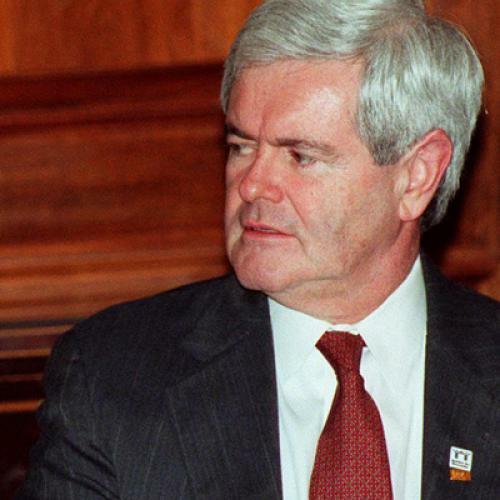 Gingrich has spent the past three decades in the public eye. He’s been the conservative champion and the disgraced politician. He’s written 17 books and been a talking head on Fox News. It’s hard to focus a singular line of attack against such an omnipresent target. This isn’t to say that Gingrich will stay untouchable forever. As The Washington Post reported this morning, Romney’s strategists are on the offensive. But Newt’s long and troubled history might make their jobs not easier, but harder.